A 60mph speed limit could be introduced on the M1 to improve air quality in Sheffield, according to reports. The mandatory speed limit, if approved, would be in place between 7am and 7pm seven days a week between junctions 32 and 35a. The plan coincides with Department for Transport (DfT) plans for a £106 million smart motorway, which is due to launch in March. However, the Government previously ruled out a reduction in the speed limit just over two-and-a-half years ago. He instead asked Highways England to investigate alternatives. 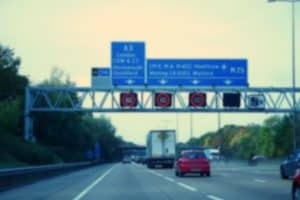 Highways England has stressed however, that the speed limit is just one of “a range of other mitigation options” being trialled, according to the Guardian. Other options, it reports, include painting barriers with “catalytic paints” designed to remove pollutants from the air and putting piles of “mineral polymer” – made from a secret compound that absorbs nitrogen dioxide – alongside the road. A Highways England spokesperson said: “Smart motorways are central to the modernisation of England’s motorways, reducing congestion and improving journey time reliability by smoothing traffic flows.